Introducing a new generation of subcompact SUV to the marketplace, the all-new Honda HR-V delivers a unique proposition to the crossover segment: stylish coupé looks with the tough stance of an SUV, the space and versatility of an MPV, sophisticated-yet-fun driving dynamics and fuel-efficient performance. Honda anticipates 70% of new HR-V customers will be conquest buyers from other brands, predominantly from the MPV and C-segment. The 4.3-metre long HR-V is designed to appeal to young singles and pre-family couples who value their lifestyles and are design conscious. From the first glance, the new HR-V portrays a characterful youthfulness; the distinctive, boldly-sculpted lines of a coupé merged with a robust SUV. The taller stature, combined with a solid design and strong presence, provides a feeling of safety, security and confidence. Inside, the new HR-V offers occupants class-leading interior space and – thanks to Honda’s innovative Magic Seat® system – high levels of versatility. High quality soft-touch materials and sophisticated design define the HR-V’s interior where Honda’s designers have married expansive spaciousness with the feel of a sporty, enclosed cockpit. The new HR-V will be available with a choice of highly efficient 120PS 1.6 litre i-DTEC diesel or 130PS 1.5 litre i-VTEC petrol engines, both part of Honda’s Earth Dreams Technology series. The diesel has a six-speed manual while the petrol has a six-speed manual or CVT. The new HR-V is part of the wave of next-generation and all-new vehicles from Honda, demonstrating the brand’s pioneering approach to technological innovation which makes life better for its customers. Honda’s all-new HR-V line-up, which will feature a choice of three equipment grades, will go on sale in the UK in late summer. It will be interesting to see how many of the HRV's features also show up on the new Jazz. While the specs (still subject to change) show that Honda didn't manage to get the diesel version's CO2 below 100 g/km, the petrol version with CVT is at 120 g/km which qualifies for £30 car tax (if bought before 1st April 2017). The equivalent Jazz should therefore be also under that threshold. European auto jury AUTOBEST has voted Honda’s HR-V crossover as a finalist in the “Best Buy Car of Europe in 2016” award. HR-V will now progress to the final testing session at Navak proving ground in Belgrade, Serbia, to compete against four other finalists. This is the first time the Japanese brand has secured a place as a finalist. The AUTOBEST organisation is composed of 26 of the most influential motoring writers from across Europe. The award seeks to recognise the new car that represents the best overall offer for a broad range of European customers. Areas of particular importance to the jury include competitive pricing, flexibility, design, connectivity and the availability of spare parts and service items. To be eligible, vehicles must be available from less than €20,000. 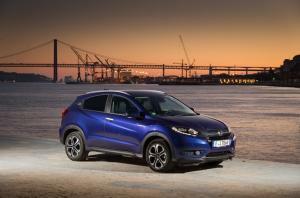 The nomination is the latest news in a successful launch year for Honda’s new crossover. Earlier in 2015, HR-V was voted most anticipated car of the year by readers of the UK’s What Car? magazine. After just six weeks on sale across Europe, Honda has received over 6,000 confirmed customer orders after six weeks on sale. About time a Honda made the final of something in Europe, but I suppose they couldn't nominate any vehicle from VW / Audi group this year (no matter how many goodies and freebies were on offer) which tied their hands a bit.